In this recipe I am using Ciabatta bread, for its’ moist centre and crunchy exterior. In Italy Ciabatta means “Slipper” and is often referred to as “Slipper Bread”, this is a reference to the shape, which does sort of resemble a slipper. Ciabatta traditionally is wide and long which makes it ideal for sandwich making. Brush the chicken fillets with a little oil and season with some salt and pepper, place on the barbecue or griddle pan. Cook for 4 – 5 minutes on each side, ensuring the chicken is fully cooked. Place the bacon slices on the barbecue and cook for a minute on each side. Slice the ciabatta in half and place brush each half with a little oil, place on the barbecue to lightly toast. To serve, place the bottom half of the ciabatta onto a plate and add a layer of rocket, mozerella and red onion. Add some tomato, then top with some sliced chicken and bacon. 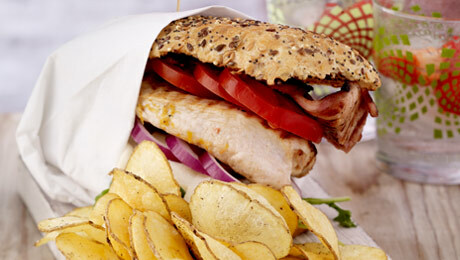 Place the top half of the ciabatta on top of the chicken, then secure with a skewer. Top with a cherry tomato garnish.